We start today’s tour in Israel to Ashkelon via Route 4 from Tel Aviv, or Route 3 from Jerusalem, with travel time up to 60 minutes. On Route 4, midway between Ashdod and Ashkelon, you may want to stretch your legs on one of Israel’s most beautiful beaches, Nitzanim. Turn right at the Eshkolot junction and follow an asphalt road for several kilometers, past a military base, toward the dunes in the foreground. As you arrive at this pristine beach you can continue for a short drive north on the sandy road, passing scrub bush and small trees covering the dunes. If time permits, you can also walk along the beach toward either Ashdod or Ashkelon, or paddle a boat during the summer in the nearby pond. Either way, you can enjoy a snack at the straw hut restaurant that attempts to blend in with the otherwise virgin surroundings. If you arrive on a weekday, you may find the dunes and beach deserted, except for an isolated camper or bather under the old umbrellas. From Nitzanim it’s a short drive to the main entrance to the city of Ashkelon. Follow Ben Gurion Street, a boulevard lined with palm trees and an occasional sculpture, through several neighborhoods towards the sea. At the end of the road turn left toward Ashkelon National Park. A visit to Ashkelon National Park is an entry into a time capsule and open air museum whose artifacts will introduce you to some of the most important cultures that have impacted the region for almost 4000 years. The name Ashkelon may derive from the ancient measure of weight known as a Shekel, and is illustrative of the city’s great commercial past. Today, the Shekel remains the currency of the State of Israel. We also know the name Ashkelon colloquially, from the scallion, as this onion was first grown and exported from Philistine Ascalon. After entering the park, your first stop should be on your right at the Canaanite gate, which may in fact be the most interesting site at the park. 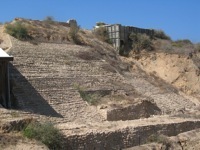 The Canaanites inhabited the Levant during the period 2200-1200 BCE and during the middle of this period Ashkelon was a major commercial center surrounded by a high wall, with an arched entrance. Substantial remnants of this mud brick arch and corridor have been beautifully preserved and integrated into a reconstructed passageway. 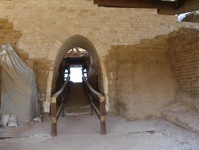 This arch is said to be the oldest to have been found in the world, dating back to 1850 BCE, and is one of the most important attractions in Israel .To the right of the arch, a fifteen meter high slopping stone and dirt rampart, known as a glacis, was constructed on top of a wall as a defensive measure. Perhaps the earliest reference to Ashkelon as a fortified city comes from the 13th century BCE Merneptah Stele, which was found at Karnak Egypt. To the right of the arch, archaeologists have discovered a small cultic precinct. An earthenware jar, ceremoniously serving as a temple, encased an almost one pound silver- coated bronze figure of a calf. The Canaanites worshiped the god Ba’al and the figurine was symbolic of that deity. Consequently, it’s placement near the arch and path to the sea may indicate that residents and visitors to the city may have paid homage to it upon their departure for or return from a voyage. 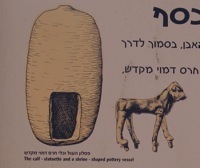 Today, the calf is on display at the Israel Museum in Jerusalem, which is a stop that should not be missed during your Israel tour. 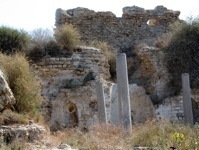 As you exit the area of the Canaanite gate, turn right and proceed to the parking lot where you will note several large columns in the grassy area in front of you. 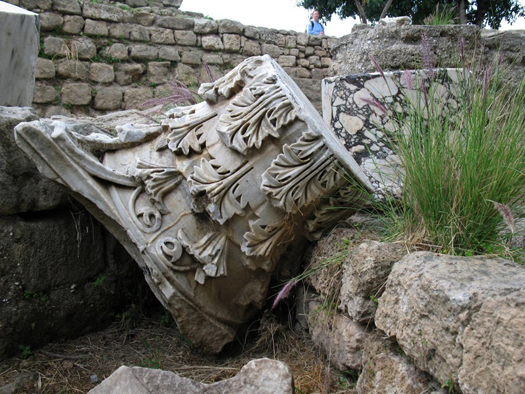 These columns are remnants of the 100 meter long colonnaded Roman Basilica, which served as the heart of the city. There, strolling over its marble floors, the citizens of Roman Ashkelon met to socialize, transact business and worship their deities. Immediately adjacent thereto was a semi- circular area containing a number of well-preserved statues, which in ancient times had adorned its entranceway. Archaeologists assume that the current level of this chamber was also the floor of the Basilica. 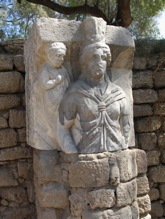 Two statues of Nike were excavated, one depicting this winged goddess of victory with a palm branch in her hand, and the other standing over the god Atlas holding a sphere. The other statue is that of the Egyptian goddess Isis.The Leon Levy Expedition recently excavated this area and discovered a Herodian basilica, portions of which you can view through the fence. The three statues have been temporarily relocated near the office. From the Basilica proceed by car toward the Dolphin parking lot entrance to the beach. There you can view remnants of the Muslim and Crusader wall with protruding Roman columns used to strengthen these seaside fortifications. As you continue your drive along the Southern and Eastern sides of ancient Ashkelon, segments of its city wall can be easily seen. In the mid twelfth century the Muslims (Fatimid dynasty) built their wall on top of the much earlier Canaanite ramparts as a defensive measure against the advancing Crusader armies. For almost 100 years thereafter, Ashkelon changed hands on several occasions between the Muslims and Crusaders, with its walls being breached and then again restored. It was only with the Mameluke Sultan Beibars’ quest for dominance over the Levant that Ashkelon was finally destroyed in 1270 CE. Your final stop in the national park will be at the remains of the St. Mary Viridis church. Originally constructed by the Byzantines in the 5th century in a basilica style, it was destroyed in 958 CE. The Crusaders rebuilt the church, altering its architecture by decreasing the number of columns, some of which remain standing to this day. The apse also remains clearly visible with the Crusader wall as an impressive backdrop. 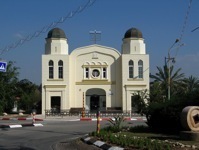 For participants in holyland travel, a visit to the church would no doubt be a meaningful stop. From the church it’s a short drive to the exit of the park. If you can wait with lunch for another thirty minutes, dining in the village of Mazkeret Batya would be an enjoyable experience. Travel in Israel is relatively easy, so return to Route 4 and travel north to Route 41 east. 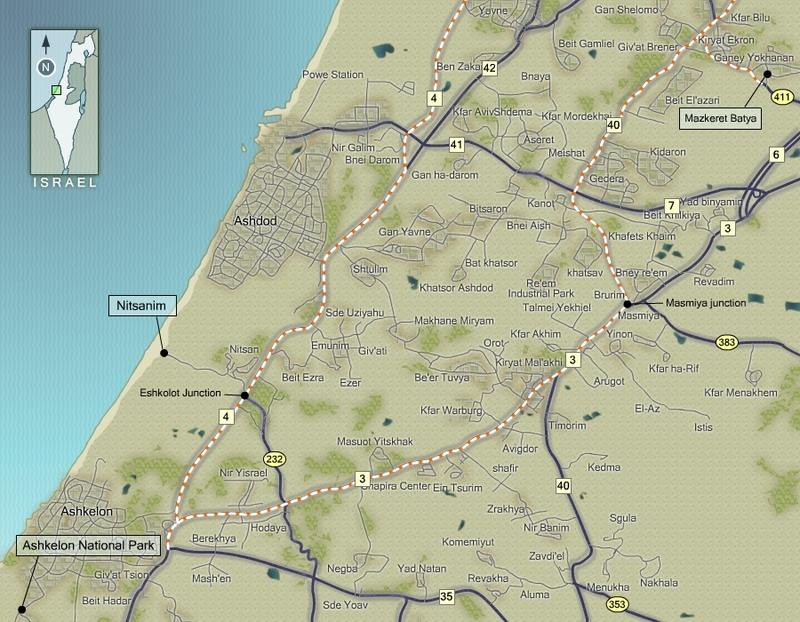 At the Gedera junction travel north on Route 40 until you reach Route 411. Travel several kilometers east and turn left at the sign for Mazkeret Batya. Park your car near the cobblestone main street and start your walking tour at the old bell across from the museum. This original bell was used to alert residents of a fire, milking time and the start of Shabbat. As with the synagogue in nearby Rishon Le-Zion, the Turks did not permit private dwellings to be built on land deemed to be agricultural. To circumvent this edict, Baron de Rothschild built four, two story buildings, which housed animals on the first floor and “soldiers” or families above. Several of these unique dwellings have been restored, and are now used as the village museum and the shops next door. Large stone barns from this period of time dot the neighborhood and are presently protected as being historically significant. 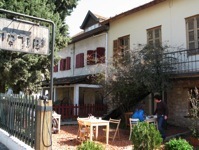 Behind the museum is a beautiful courtyard with a restaurant and gift shop.Numerous B&Bs can also be found along the main street. Though the Baron previously assisted the settlers of Zichron Yaakov, Rosh Pina, and Rishon Le-Zion financially, Mazkeret Batya was the first actual agricultural “colony” established by Rothschild. In doing so, he changed the name of the village from Ekron to Batya, in honor of his mother. In fact, the museum contains many interesting artifacts, photos, and historical documents attesting to his efforts to establish a settlement. Among these is a picture of the village Pavlovka, in White Russia, from which the 11 founding members of the village emigrated, as well as their contract with the Baron’s representative. A short walk to the left and around the corner from the museum will bring you to a beautiful structure adorned with half circle windows, which housed the settlement’s agricultural equipment and produce. Immediately behind it is the restored well with its interesting water buckets and large mechanisms, which were pulled by a horse or camel. At the conclusion of your visit you may wish to drive down the main street to admire the double domed synagogue, which was built in 1927 with funds donated by the Baron. 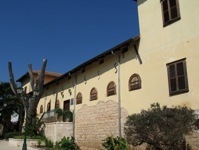 During Israel’s War of Independence the synagogue was used as a field hospital for soldiers wounded in the effort to open the road to Jerusalem. 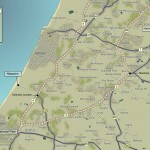 At the conclusion of your visit return to Route 40 north which will intersect with Route 1 to Tel-Aviv and Jerusalem. There is a podcast available for this post. To listen to it now click this link. If you would like to download it, right click the link and select the appropriate dowload option. Please check out on of my other posts for more ideas regarding places to visit and things to do on your trip to Israel.